Classical homocystinuria (HCU), also known as cystathionine beta-synthase (CBS) deficiency, is the most common of the homocystinuria group of inherited metabolic disorders. 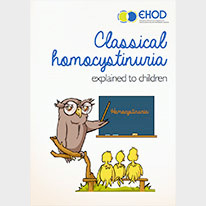 The information below describes what classical homocystinuria is, how it is diagnosed, what tests are needed and what other health conditions are linked to HCU. We hope that after reading it you will understand more about the disorder – Understanding more about HCU may help you cope more easily with the disorder, as well as helping you discuss tests and treatments with your medical care team. You can visit the HCU Disease Checklist and HCU Infographic for more information. 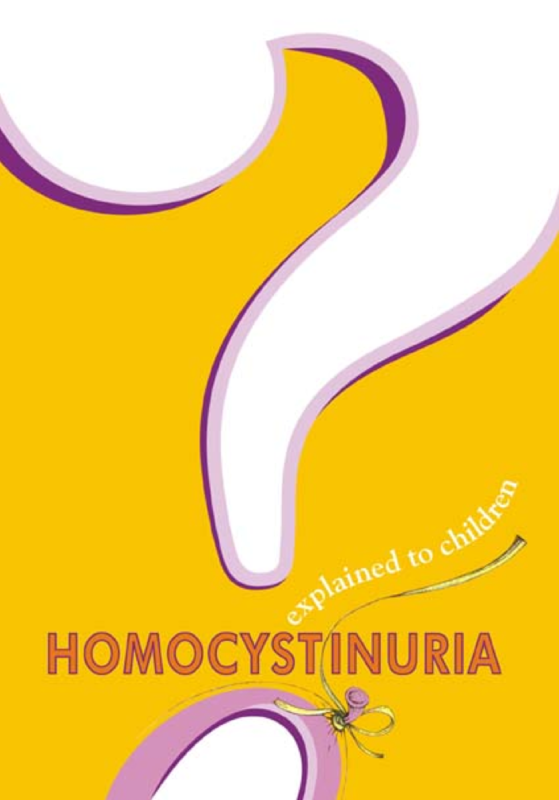 You can access the Classical Homocystinuria Patient Information Booklet and Quick Guide here. HCU gets its name from the high levels of the amino acid homocysteine detected in the urine (homocystin-uria). Homocysteine is made from another amino acid, called methionine, which we get from the food we eat. When food is digested the larger nutrients (carbohydrates, fats and proteins) are broken down into smaller molecules so they can be absorbed by our bodies and travel to where they are needed. The proteins in foods such as nuts, meat, fish, and dairy products are broken down into smaller amino acids, one of which is methionine. Some of the methionine is reused by the body to make new proteins, but some are broken down to form homocysteine (figure 1). Normally, homocysteine is then converted into the amino acids cystathionine and cysteine (figure 2), but sometimes the process is faulty and leads to high homocysteine levels and, over time, these can cause problems. The term ‘metabolism’ refers to all the various chemical processes that are continuously going on inside our bodies, enabling us to function normally. A metabolic pathway is a series of chemical reactions that transform one or more chemicals into something that is needed by our body. Metabolic disorders occur when there are problems with one (or more) of these chemical reactions. Enzymes, such as CBS, are special proteins that help control the chemical reactions that occur in the various metabolic pathways in our bodies. The CBS enzyme converts homocysteine to cystathionine. In people with HCU, the CBS enzyme is faulty leading to high levels of homocysteine and methionine, and low levels of cystathionine and cysteine. Vitamins B6 (pyridoxine), B12 (cobalamin) and folate are also needed to help make the breakdown processes of methionine and homocysteine work efficiently (figure 2). What problems can occur in people with HCU? The genetic fault causing HCU is present at birth, but problems do not develop immediately. The severity of HCU varies and depends on whether the faulty CBS enzyme is completely inactive or can still break down some homocysteine. Without treatment, people with a severe form of HCU often have a developmental delay in early childhood, followed by progressive problems affecting their eyes and skeleton. In contrast, people with a mild form of HCU may not be aware anything is wrong until after they have a blood clot as an adult. There are several different treatments available for individuals with HCU. People with a mild form of HCU often respond to large doses of vitamin B6 (pyridoxine). This is probably because their CBS enzyme is still working but is unstable, so there is less enzyme present than there should be – the vitamin B6 is thought to help stabilise the enzyme. People who do not respond to vitamin B6 treatment need to be on a special diet that is low in methionine. A low-methionine diet has less methionine available to be broken down, so less homocysteine is made and less accumulates in the body. Methionine is an essential amino acid – a building block of proteins we need for healthy growth and development that we can only get from food. When you have HCU your diet is important and needs to be a balance between providing the right amount of methionine needed by your body, while maintaining homocysteine at acceptable levels. High protein foods like meat, poultry, fish, dairy and eggs contain the richest amounts of methionine, followed by legumes and nuts, cereal-based foods and vegetables. Some people may need to closely watch their protein intake, while others may tolerate a vegetarian diet or even small amounts of animal-based protein. Specialised formulas or supplement drinks rich in other amino acids can help improve your nutritional balance and homocysteine levels. Folic acid is usually added to the diet, and vitamin B12 and betaine may be needed in some patients to help promote the conversion of homocysteine back to methionine (figure 2). Learning to manage a low-methionine (protein) diet in day-to-day life is not easy. You can get help from specialised metabolic clinics or dieticians experienced in managing these types of diets and from talking to other people with HCU and their families. Inherited disorders are medical conditions caused when there are problems with a gene. Genes are passed onto us from our parents and they determine the way we are, for example, the colour of our eyes and hair. Each gene instructs our bodies to produce a particular protein. These proteins are then used by the cells in our bodies to do particular jobs such as digesting food or building muscles and bones. Genes are complex molecules and occasionally get changed slightly (mutated) or even go missing. Everyone has two copies of each gene – one inherited from each parent. For many genes, we only need to inherit one working copy; people remain healthy if they have one faulty copy of the gene, but they get problems if both copies are faulty. This is what happens in HCU where an affected child has two faulty copies of the CBS gene. Each parent has one faulty copy (that has been passed onto the child), but also a normal working copy of the gene, so the parents do not have HCU and are called carriers. If the parents have another baby, they may each pass on their faulty gene again, in which case the new baby will also have HCU; if one parent passes on their normal copy of the gene, the baby will be a carrier and, if both parents pass on their normal copy, the baby will neither have HCU nor be a carrier. 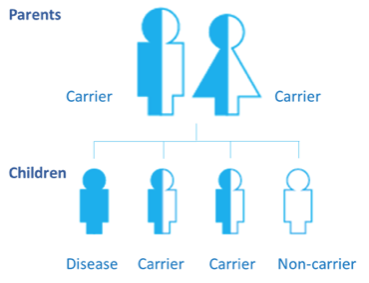 Overall, when both the parents are carriers, the chances of having a child with HCU is 1 in 4 for each pregnancy (figure 3). Figure 3: Homocystinuria is an autosomal recessively inherited disorder. This means that an individual must inherit a defective copy of the CBS gene from each carrier parent. Is HCU a rare disease? The HCU diagnostic journey can be a long and frustrating one for both the individual and their families. HCU is a rare disease so the variable, non-specific symptoms in a child are not always recognised. For example, some people have a severe form of the disease that affects lots of different parts of their body from an early age, whilst others only show signs of the disease when they are adults. Children are more likely to first see a doctor because of an eye or developmental delay problem, whereas an adult is more likely to be diagnosed after a blood clot. In Australia, babies are tested at birth for HCU, but newborn screening tests do not currently detect all of the cases and this type of screening is not available in all countries. If HCU is diagnosed from a positive newborn screening test, treatment is easier to implement and prevention of all the recognised complications becomes a realistic goal. If a baby is not diagnosed during newborn screening, over the following years they may end up seeing many different medical specialists before a diagnosis is made. HCU diagnosis is based on clinical presentation (signs and symptoms) and laboratory (biochemical and genetic) tests. Once the doctor thinks (or has a ‘clinical suspicion’) that HCU could be present they use biochemical tests of the urine and blood to confirm the levels of the different amino acids involved in the metabolism of homocysteine and methionine (figure 2). High levels of methionine in blood. Blood plasma samples are usually tested for the presence of high homocysteine levels. Plasma is the liquid part of the blood that remains after the red blood cells, white blood cells and platelets are removed by centrifuging unclotted whole blood. The total homocysteine (tHcy) concentration is measured; tHcy is the sum of the all the free and protein-bound forms of homocysteine found in plasma.2 Just testing for free homocysteine (fHcy) is no longer recommended as only small amounts of the amino acid exist as fHcy, and the test is considered insensitive and unreliable.2 Plasma, rather than whole blood, samples are used because free homocysteine is released from blood cells and can artificially increase tHcy levels. Newborn screening for HCU is usually done by testing a few drops of blood from a heel prick when a baby is about 2-5 days old. The drops of blood are soaked up by a special card, dried and tested – this is called a dry blood spot test. HCU is suspected if the baby’s blood is found to have higher than normal levels of methionine and further tests are needed to confirm the diagnosis (as other conditions can also cause high levels of methionine in blood). Newborn screening has its own set of testing problems and not all HCU cases can be picked up at this point, especially the milder cases of the disease. The initial biochemical tests are normally followed by confirmatory tests (enzyme or DNA analysis). If one of these techniques does not confirm the diagnosis in someone with unusual blood results, then the other test should be carried out as well – to double check.2 This is particularly important if the disease is a mild form of HCU and there is more uncertainty over the diagnosis. Prenatal testing during pregnancy if both parents are carriers. Pre-gestational diagnosis (PGD) is also possible: this is where an embryo is tested prior to implantation when in vitro fertilisation (IVF) is used. A more ‘severe’ vitamin B6 non-responsive form. It is recommended someone with HCU is tested to see if they are responsive to vitamin B6 – that is they are able to achieve close to normal homocysteine levels with only vitamin B6 supplements. Some people are only partially responsive to vitamin B6 and need this supplement plus some extra treatment such as low protein diet. Prevent further complications developing – in late-diagnosed HCU. Although there is no cure for HCU, it is a treatable condition. For those people who have been diagnosed with HCU later in life, the main aim of HCU treatment is to prevent further complications. Behavioural and intellectual improvement has been reported in some studies,11 but the main goal is to prevent blood clotting (thromboembolic) problems, such as strokes, which can be fatal and are the most commonly seen ‘late’ HCU complication. The aim of HCU treatment is to keep homocysteine concentrations in the body at safe levels (as normal as possible) while maintaining the body’s normal growth and nutrition. Some people who are partially-responsive to vitamin B6 may be able to achieve their target level if they are also on a low-methionine diet, while for other people it is just not a realistic goal even on a restricted diet. If methionine in the diet is restricted too much (so that the methionine concentrations in the blood are sometimes below the normal range of about 15-40 μmol/L) normal growth and development in children may be affected. Remember that keeping homocysteine concentrations at exactly the right level can be tricky – if they are okay most of the time that is fine – occasional low or high levels are bound to occur. The current HCU recommended treatment involves low-methionine (protein) diets with additional dietary supplements. Dietary management should be considered for all those people who are vitamin B6 non-responsive (i.e. cannot control homocysteine levels with only vitamin B6 supplements), and as an additional treatment in individuals who are partially vitamin B6 responsive.2 Some patients will combine dietary treatment with the drug, betaine (discussed below). HCU cannot be cured so treatment must continue for the whole of the individual’s life. The amino acid methionine cannot be made by the body and is contained in the foods we eat. Methionine is found in all foods that contain protein, particularly protein-rich foods such as nuts, meat, fish, legumes and dairy products (see also page 4). If the amount of methionine in the diet is reduced, the amount of homocysteine produced by the body is also reduced (because homocysteine is only be made in the body from methionine – figure 2). The strictness of the methionine (protein) restriction required will vary from person to person and is worked out by first checking and then rechecking the levels of homocysteine and methionine in the blood (this is usually done by a metabolic dietitian). Methionine is essential for normal growth and development (particularly in children) so close monitoring of methionine levels and growth are needed when HCU is severe and a low-methionine diet is recommended. Most people with vitamin B6 non-responsive HCU can only reach the recommended homocysteine targets if their diet is very low in foods containing protein, so low that they need supplements of a methionine-free amino acid mixture to avoid protein malnutrition. The amino acid, cysteine, is normally formed when homocysteine is broken down (figure 2), so people with HCU may have low levels. To avoid this, cysteine is included in the methionine-free amino acid supplement in the form of cysteine. The different amino acids and metabolites with similar sounding names can be confusing when you start learning about HCU. Cystine is made from two cysteine molecules joined together. This reaction occurs spontaneously but the body can convert cystine back to two cysteine molecules. (Similarly, homocysteine is formed from two homocysteine molecules joined together). Even if a restricted diet is recommended it should still be nutritionally complete and contain all the nutrients and energy requirements the body needs. For example, most amino acid supplements contain vitamins and minerals and many now also contain long-chain polyunsaturated fatty acids as low-methionine (protein) diets may not provide enough. People with HCU may not have enough vitamin B12 or folate – this can be due to the disease itself or because of a restricted diet. These two vitamins, along with vitamin B6, play important roles in the metabolism of homocysteine and methionine (figure 2). It is important that our bodies have enough so everything functions properly. The guidelines recommend that everyone with HCU is given low-dose folate supplements and that vitamin B12 should be monitored and supplemented only if needed.2 Vitamin B12 and folate supplements are generally included in methionine-free amino acid supplements so, if you are taking one of these, additional supplements may not be needed. Betaine is a chemical that can convert homocysteine back into methionine (figure 2). It is sometimes added to the diet if homocysteine levels are above the targets goals. For adults – a starting dose is 3 g taken twice a day. It is important to monitor blood samples for homocysteine, other amino acids including methionine, folate and vitamin B12 regularly during treatment – how often will depend on things like how severe the HCU is, the type of treatment being used, as well as the age and medical condition of the individual.2 People on dietary treatments will also need regular nutritional assessments to check all their nutritional needs are being met. There are times when special attention to dietary and other treatments may be necessary. For example, having surgery, being ill or being immobilised (not moving for a period of time) all have their own particular issues. Compliance means correctly following medical advice. For HCU, good treatment compliance is very important for the best long-term health results. Getting adolescents and young adults to take supplements and stick to their required dietary changes can be difficult. It is very important that they fully understand the serious consequences of not following treatments and not keeping homocysteine levels within their target range – however boring or difficult they think the treatments are! Because HCU increases the risk of blood clots, it is important not to become dehydrated when you are ill (for example, through diarrhoea and vomiting) or to stay in bed (immobilised) for too long. If you have had a blood clot or have a high risk of one forming, your doctors may recommend taking heparin as a preventative while travelling. Many doctors may not have come across HCU before, so carrying some information that helps explain the rare condition may be useful when you are travelling. For longer periods away from home, your medical care team may be able to suggest a local doctor that could help supervise your care. An accurate diagnosis is the first step to improving the care and outcomes for those living with a rare disease such as HCU. The second step is following the recommended long-term treatment. In HCU the loss of biochemical control, at any age, can lead to serious complications that may be life-threatening.2 These complications can be prevented with long-term treatment, but once the damage has occurred it usually cannot be reversed. However, treatment can prevent existing complications from getting any worse and other problems occurring. This means people, teenagers and young adults in particular, who may not follow recommended treatments put their health at risk. When HCU is detected early and treated appropriately, children are able to reach their full potential. The risk of complications occurring (and their severity) is related to the age at which HCU is diagnosed, how well treatment is followed and whether it responds to vitamin B6. In the more severe vitamin B6 non-responsive form of HCU, the best outcomes are achieved when the disease is identified by newborn screening and treatment is started soon after birth. The major complications of untreated HCU affect four parts of the body: the eyes, the skeleton, the brain, and the vascular system. All four of the systems can be affected or only one of them. Complications can vary from mild to severe – but are progressive unless HCU is diagnosed and treated. Other complications include glaucoma (loss of vision due to increased pressure in the eye causing optic nerve damage), and retinal detachment (separation of the layer of nerve cells lining the back of the eye). ‘Quivering’ or ‘trembling’ of the coloured part of the eye (iridodonesis) occurs with early dislocation of the lens. Following diagnosis, regular check-ups with an ophthalmologist are recommended. Physical activity is important for everyone’s health and well-being and many activities can be safely incorporated into your daily routines. However, because of the risk of lens dislocation contact sports, such as rugby and boxing, should be avoided. Osteoporosis (bone weakening), especially of the spine, is the most consistently seen skeletal complication and bone density scans are recommended every 3-5 years from adolescence.2 If low bone density becomes a problem, vitamin D and dietary calcium levels may need checking and weight-bearing exercise may be recommended to help improve bone health. The vascular (circulatory) system is made up of arteries, veins and capillaries that carry blood around our bodies. HCU increases the risk of blood clots (thrombi) developing. In HCU, strokes (particularly in young people) are caused by a blood clot blocking a vein that stops blood draining out of the brain (sagittal sinus thrombosis). This is unusual as most strokes are caused by abnormalities of arteries carrying blood into the brain. HCU does not appear to affect fertility, so some form of contraception will be need if you are not planning to start a family. Women should avoid any contraceptives containing the hormone oestrogen as it increases the risk of blood clots (thrombosis). Where possible, a pregnancy should be planned so care can be provided before and after conception. By sticking to the recommended treatments, complications can usually be prevented and there have been many successful pregnancies and births reported. Once you fall pregnant, having HCU does not appear to increase your risk of miscarrying (if metabolic control is good) or increase the risk of birth defects.2 HCU does, however, increase the risk of blood clots during pregnancy, at delivery and for a few weeks after the birth. Making decisions or expressing opinions about different treatments, sharing information and feelings, and accepting health team instructions are all part of the HCU journey – a process that aims to support people to stay well and manage their own conditions better. It is important to find out as much as possible about HCU and its treatment, so you can talk over any problems or concerns you have with your medical care team. A metabolic disorder is not something you can manage on your own – it is a team effort and with support, things can seem a little less daunting. Asking questions and being informed means you are in a better position to make the best decisions for you or your child. It is often helpful to write down any questions you want to ask and take them to your next appointment. What is your experience with HCU? What does the diagnosis mean for me/my child/our family now and in the future? What further screening/testing/follow-up appointments are there? How long will the test results take to come through? Can you go through the test report (again) with me? What does each treatment option require of me? If my child were to have a child of their own, would they also have HCU? Do I and my partner need testing? Will other members of the family need testing? How/when do we explain HCU to our child? Are there any other medical problems associated with HCU? What services am I likely to need? Any information provided by the above sources should be discussed with your medical care team and should not replace their advice. This is not a complete list of HCU information sources. 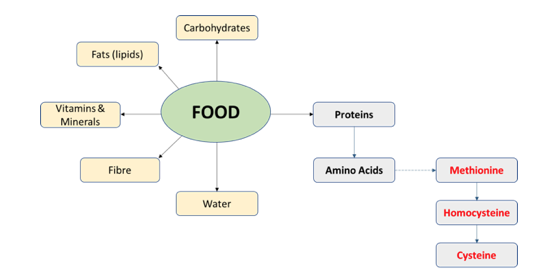 Amino Acids – are the basic building blocks of proteins. Anticoagulants – are medications, such as heparin, that are used to help prevent blood clots forming. Catalyst – is a substance that helps speed up a chemical reaction but is not permanently changed in the process. Cerebral oedema – or brain swelling, is the build-up of fluids in the tissues of the brain. Chromosome – is a structure in our cells that is made up of a very long strand of DNA. A chromosome can contain thousands our of genes and is involved in the transmission of heredity information. Clinical presentation – the physical signs and symptoms associated with a particular disease that are used to help diagnosed the condition. Cobalamin – is another name for vitamin B12. Cystathionine – is an amino acid that is an intermediate stage in the production of cysteine. Methionine is metabolised into homocysteine, which combines with serine to form cystathionine which is then converted to cysteine. 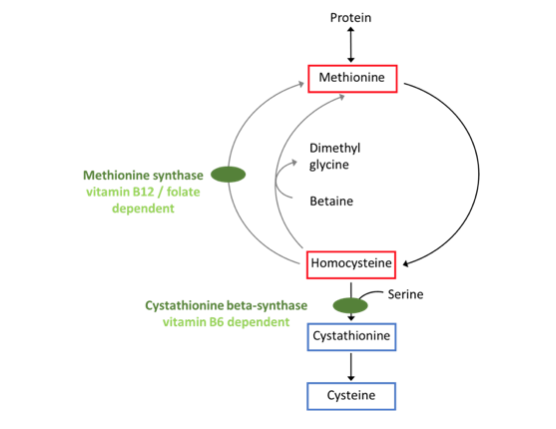 Cystathionine beta-synthase – also known as CBS, is an enzyme that catalysts the conversion of the amino acids homocysteine and serine into cystathionine. Cysteine – is a non-essential amino acid that is produced in the body from the essential amino acid methionine; cysteine may become semi-essential when methionine intake is limited. DNA – or deoxyribose nucleic acid, is a long molecule that contains our unique genetic code (the instructions needed to make all the proteins in our bodies required for us to develop, live and reproduce). Ectopia lentis – dislocation of an eye lens. Enzyme – is a protein that acts as a catalyst within living cells and helps speed up a chemical reaction. Essential amino acids – are amino acids that cannot be made (synthesised) within our bodies and need to be provided by our food. Folate – also called vitamin B9 or folic acid. Genes – are the basic units of heredity and act as instructions to make all the body’s proteins. Genes are made up of small sections of DNA and are located in our chromosomes. Gene mutation – is a permanent change in the DNA sequence that makes up a gene and can affect a single DNA building block or a large part of a chromosome that includes many genes. Genu valgum – is another name for knock knees (where the knees angle in and can touch each other when the legs are straightened). Glaucoma – is a condition that affects the optic nerve connecting the eye to the brain and is often caused by increased pressure in the eye. Glaucoma can lead to permeant vision loss. Homocysteine – is an amino acid which is an intermediate in the metabolism of methionine and cysteine. Index case – is the first person to be identified in a group of related cases of a communicable or heritable disease. Marfan syndrome – is a genetic disorder of the body’s connective tissue and can affect the heart, eyes, skeleton and lungs. Metabolic disorder – occurs when the normal metabolic processes in the body fail and causes either too much or too little of particular substances needed to stay healthy. Metabolic pathway – is a linked series of chemical reactions that occur in a cell that either lead to the production or breakdown of particular substances. Metabolism – is the many different chemical reactions going on continuously inside our body’s that allow us to live and function normally. Metabolites – are the substances that are produced during metabolism or take part in a metabolic process. Methionine – is one of nine essential amino acids we need to have in our diet. It is metabolised to form homocysteine. 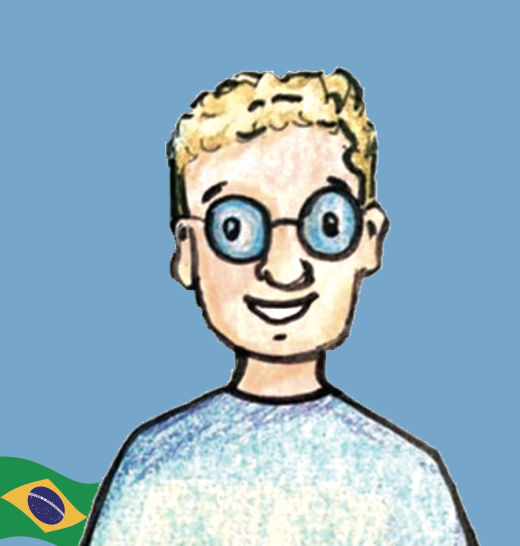 Myopia – is another name for short-sightedness. Neuropathy – is damage or disease that affects nerves. Newborn screening – is where a newborn baby is tested for certain harmful or potentially fatal disorders that are not otherwise apparent at birth. Non-essential amino acids – are amino acids that can be made by our bodies and are not ‘essential’ in our diet. Ophthalmologist – is a doctor who has specialist training in the diagnosis and management of disorders of the eye and visual system. Osteoporosis – is a condition that affects bones causing them to become weak and more likely to break. Pectus carinatum – a protruding chest. Pectus excavatum – a sunken chest. Pes cavus – is a foot with a high instep or arch. Prenatal – is something occurring before birth. Prognosis – is the opinion, based on medical experience, of the likely course of a medical condition. Pyridoxine – is another name for vitamin B6. Scoliosis – is a sideways curvature of the spine. Thrombus – is a blood clot (plural: thrombi). Thromboembolism – is when a blood vessel becomes blocked by a blood clot that has become dislodged from another blood vessel and travelled through the circulationary system. 1. Street RL Jr, Makoul G, Arora NK, Epstein RM. How does communication heal? Pathways linking clinician-patient communication to health outcomes. Patient Educ Couns. 2009; 74:295–301. 2. Morris A, Kožich V, Santra S, et al. Guidelines for the diagnosis and management of cystathionine beta-synthase deficiency. J Inherit Metab Dis. 2017; 40:49–74. 3. NIH. Your digestive system and how it works. Homocystinuria. Available from: https://www.niddk.nih.gov/health-information/digestive-diseases/digestive-system-how-it-works (accessed 4 April 2018). 4. Testai FD, Gorelick PB. Inherited metabolic disorders and stroke Part 2: Homocystinuria, organic acidurias, and urea cycle disorders. Arch Neurol. 2010; 67:148–153. 5. Therapeutic Goods Administration (TGA). Orphan drugs program discussion paper. May 2015. 6. NIH. GARD Genetic and Rare Disease Information Center. FAQs about rare diseases. Available from: https://rarediseases.info.nih.gov/diseases/pages/31/faqs-about-rare-diseases (accessed 4 April 2018). 7. Rare Voices Australia. What is a rare disease. https://www.rarevoices.org.au/page/15/what-is-a-rare-disease (accessed 4 April 2018). 8. HCU Network Australia, unpublished data. 9. NIH. Your guide to understanding genetic conditions. Homocystinuria. Available from: https://ghr.nlm.nih.gov/condition/homocystinuria#statistics (accessed 4 April 2018). 10. HCU Network Australia, unpublished data. 11. Grobe H. Homocystinuria (cystathionine synthase deficiency). Results of treatment in late-diagnosed patients. Eur J Pediatr. 1980; 135:199–203. 12. Sacharow SJ, Picker JD, Levy HL. Homocystinuria caused by cystathionine beta-synthase deficiency. 2004 Jan 15 [Updated 2017 May 18]. In: Adam MP, Ardinger HH, Pagon RA, et al., editors. GeneReviews® [Internet]. Seattle (WA): University of Washington, Seattle; 1993-2018. Available from: https://www.ncbi.nlm.nih.gov/books/NBK1524/ (accessed 4 April 2018). 13. Kraus JP. Homocystinuria due to cystathionine beta-synthase deficiency. 2015. Available from: https://rarediseases.org/rare-diseases/homocystinuria-due-to-cystathionine-beta-synthase-deficiency/ (accessed 4 April 2018). Pip Stosic: Medical writer, Sydney, Australia. Sue Thompson: Genetic Metabolic Disorders Service, The Children’s Hospital at Westmead, Sydney, Australia. Professor Bridget Wilcken: Genetic Metabolic Disorders Service, Sydney Children’s Hospital Randwick, Sydney, Australia.